Delhi is one of the best examples in the world where “old meets new”. 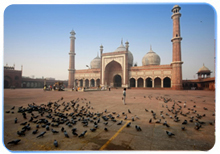 Tour of Delhi will provide the visitor ample experience to understand at once the historic time-honoured Mughal monuments to modern structures, soaring skyscrapers to salubrious parks and serene gardens. Green Chili Holidays provides you with an opportunity to experience an exclusive and refreshing Old Delhi travel experience. 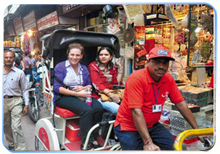 On our Rickshaw ride tour of Old Delhi your senses will come alive as you will come across the many enchanting sights and sounds this amazing city has to offer. 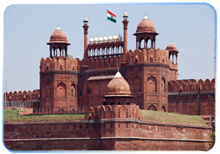 “The Red Fort and the city of Shahjahanabad were constructed by the Emperor Shah Jahan in 1639 A.D. The layout of the Red Fort was organised to retain and integrate this site with the SalimgarhFort.The fortress palace is an important focal point of the medieval city of Shahjahanabad. The planning and aesthetics of the Red Fort represent the zenith of Mughal creativity which prevailed during the reign of Emperor Shahjahan. This Fort has had many developments added on after its construction by Emperor. Sightseeing by air conditioned vehicle as per the programme. Services of local English Speaking Guide as per programme. Photo Stop at the Red Fort. Monument Fee to the places visited as per the itinerary. Personal expenses such as table drinks telephone calls or tip etc. Any additional expenses caused by disturbance in program due to weather conditions, sickness, natural disasters, riots etc. Liability for or insurance against injury, loss of life, accidents or loss of goods. Please Note: The above price is based on minimum 02 persons travelling together.